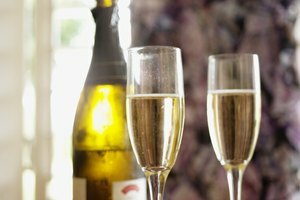 Champagne is one of the world's most popular celebration drinks and is commonly referred to as bubbly or sparkling wine. Most champagnes created today contain a mixture of Pinot Noir, Chardonnay and Pinot Meunier grapes. They are pressed and fermented two or three times, creating the sparkling wine (wine with bubbles) known as champagne. Many connoisseurs believe that the highest quality, true champagne can only come from the Champagne Ardenne region of France. Because champagne is under pressure and chilled during serving, a stuck cork can become an issue -- quickly resolve it with a towel and a steady hand. Remove the foil and wire basket from the top of the bottle. Drape the towel over the top of the bottle and remove any condensation from the neck and cork area. Grasp the dry neck with one hand and the towel-covered cork with the other hand. 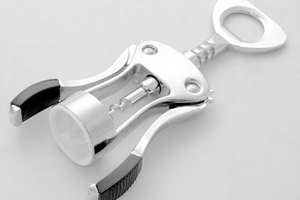 Twist the bottle and cork in opposite directions while pulling up slightly on the cork. You should feel the cork begin to slip with the added grip of the towel. Continue pulling and twisting until the cork pops off. The towel technique works well for removing stuck corks and also for catching any champagne that may spill during the opening process.